Camping used to have a ‘poor mans’ image – it’s what you did if you were broke, had kids and needed a holiday, or if you were a bloke’s bloke and fancied a long hike and getting back to nature. However, the pastime is no longer limited to ‘a wet, muddy weekend’ wearing wellies and shivering in a single room dome tent, or at least, it doesn’t have to be. While you can still buy a cheap dome tent for £20 and head off to the nearest festival, in general, modern campers want more comfort and luxury. To what degree of course, varies, but at the top end, camping set ups can be super competitive and Mrs. Bouquet would certainly meet her match! 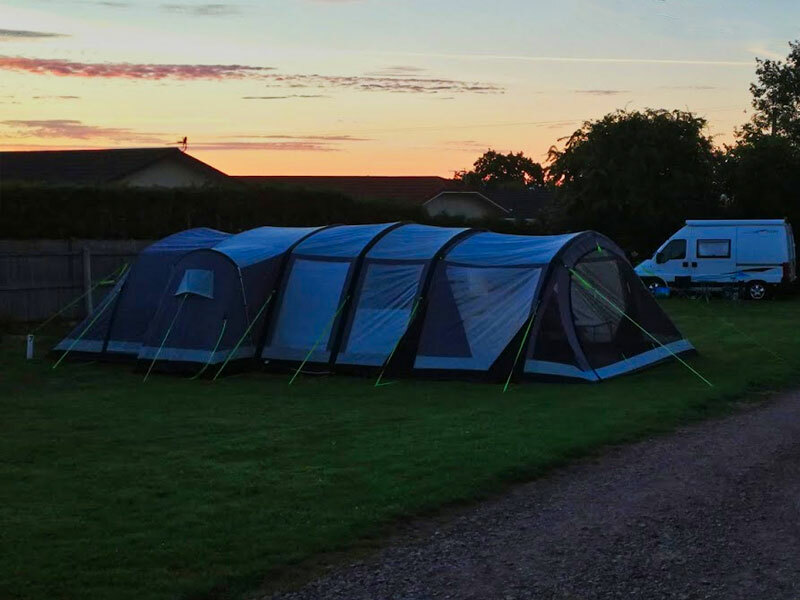 As a pastime, camping and the gear that goes with it is getting more selective, with upmarket features requiring a bigger budget – with many airbeam tents now costing in excess of £1500.00, there’s good reason for everything else to have premium to match. Here’s some of the luxuries we’ve seen on our travels this summer – and some of the tiny tents that may not be great in a heavy rainstorm. What tents say about how many people they will sleep is honestly no guide as to their size. I was impressed when Mark secured a ‘5 berth’ dome tent for our first trip. It just about fitted 2 single air beds and at 6ft 2ins, he had to leave the door open because his feet wouldn’t fit inside the tent! It was only slightly bigger than this ‘4 berth’, although it had a higher hydrostatic head than this, which at 1500hh is not so great. Decide how much space you really need and look at the dimensions. If it rains being crammed in one room like sardines won’t make for great camping. Something like this 4 berth from Halfords, at £50, is probably a good starter buy for a family of 4 – anything smaller and you will probably be too cramped. However, these days, big tents are big business, and if you are camping with kids, you will appreciate more space. 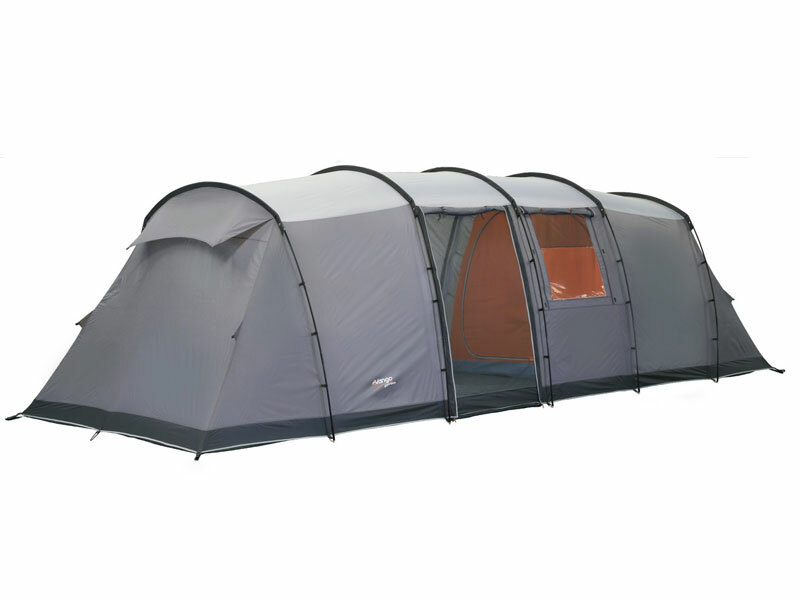 If your budget can stretch to it, this larger 8 berth model in Go Outdoors for £230 is from Vango, a superb manufacturer and will give your kids separate bedrooms, and you can even open up the two on the other side to make one large bedroom for you. 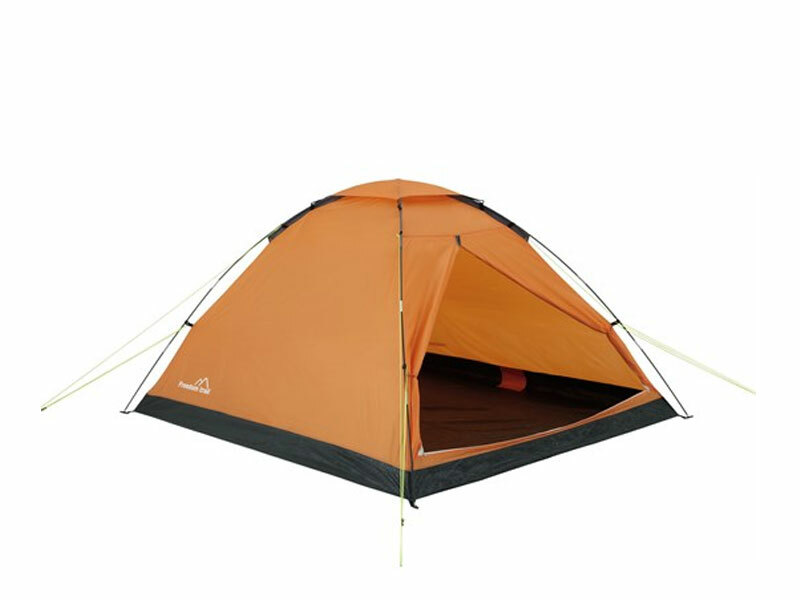 All these affordable tents are a great way to start camping, but many campers want more comforts and an easy pitch. Welcome to the airbeam! We used to say the easiest way to see if you and your partner could last was to take a metal pole frame tent and go camping. Do that without arguing, and you can do anything (and yes, we’re human and have had more than a few differences over the years when it comes to pitching a tent). Our old, metal framed Amazon 600 used to take an hour to pitch, although on a windy day when the wind kept catching up the canopy, it took 3 hours and the campsite owner, ever helpful Geraint at Dunston Hill, lent us extra muscle in the end while we hammered it in! All of us old-school campers have had similar experiences at some point. 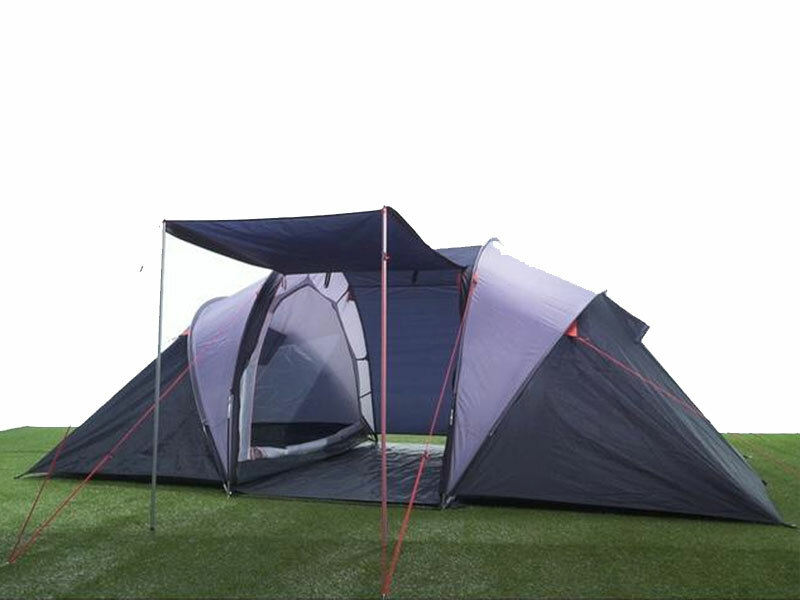 However, airbeam tents are changing all that. Peg out the corners, a few quick puffs (or for the truly lazy, like us, a quick connection of the electric pump), peg the guylines and you’re done! OK, that’s over simplifying the task a little. It’s more than just a few puffs when you have a giant tent, but in the main, erecting an airbeam is not half so much effort as a traditional metal frame tent – our Kampa Bergen, complete with canopy and vestibule extensions takes about 20 mins from start to finish, and thankfully my husband can do it without my help – great if, like me, you are riddled with arthritis. Kampa Bergen 6 with canopy and vestibule at sunset… solo pitched by my husband! I’m the wife that sat on the bench with a video camera while he does all the work – but he loves me, and I did buy him a pump! Here’s our giant beast in all it’s glory – but be warned, airbeams are MUCH heavier than frame tents. The competition at the top end of the market is certainly keen, with Kampa, Outwell and Vango all vying for the top airbeam tent spot, as well as up and coming brands like Zempire and Outdoor Revolution, meanwhile established players like Coleman are doing well in the mid-range market. Go Outdoors and Halfords are often the first port of call for first time campers – but there is often a wider choice, so think about visiting some of the other suppliers, too. Tip to those who fancy it next season, buy now, the end of season sales in places like Winfields, Attwoolls and Camping World means you can pick up a real bargain and have a much wider choice – bargains are always welcome in a market that is seeing some of the Outwell top models fetching in excess of £3000 when the sales aren’t on. Most major suppliers offer low rate finance options, meaning you can pay off over the winter ready for Summer! No, I’m not joking, tent styling is a thing. The way a tent looks is important and campers take the way their tents look really seriously. Many campers want a tent to be their home from home, with thoughtful decorative touches like bunting, fairy lights, privacy windbreaks and even camping club flags hoisted on a pole! Some even take gnomes to put outside the door, for me, that’s a stage too far – but it’s fun, expresses personality and that’s as it should be. Each to their own… gnomes and all! A look on Facebook camping groups like INTENTs usually sees campers proudly posting pictures of their ‘camp set ups’ – typically huge tents, with massive separate shelter kitchens and cosy lounges that rival anything at home. The EHU no longer just charges mobile phones, many tents are now complete with a cosy lounge, satellite TV system, fridges, portable internet and even laptops and gaming consoles. Yes – it still may rain, and the field may get muddy, but in the main, campers don’t mind staying under canvas with a cold beer – sometimes even while sat on a sofa watching Corrie! 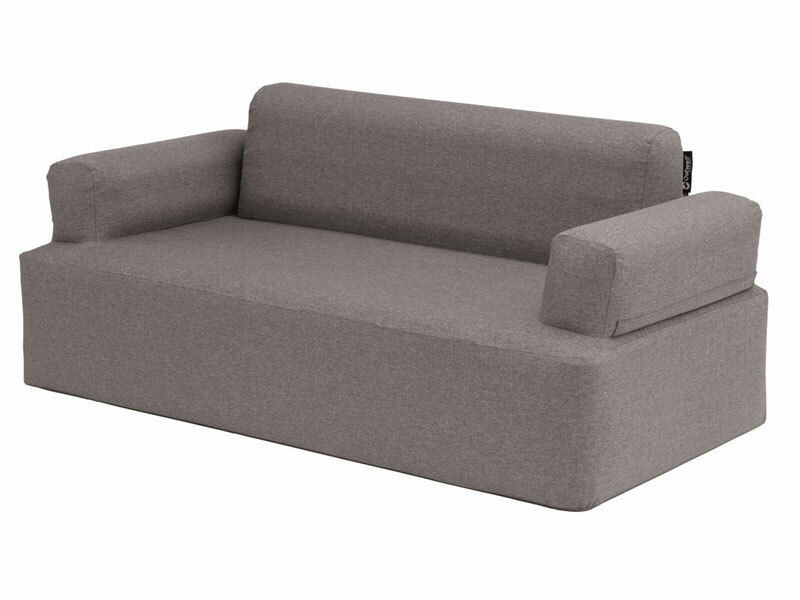 We have some lovely comfortable Vango lounger chairs, but my heart has been stolen by this Outwell sofa – that wouldn’t look out of place in my lounge at home. I’ve yet to persuade hubby that the TV is essential, but we will put up our hands to taking laptops and wifi. 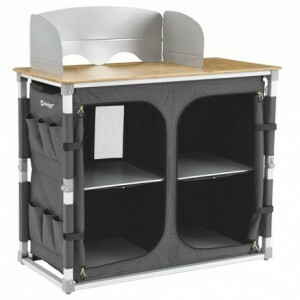 A word too, about the EHU – it isn’t a necessity for ‘posh’ campers to have one. 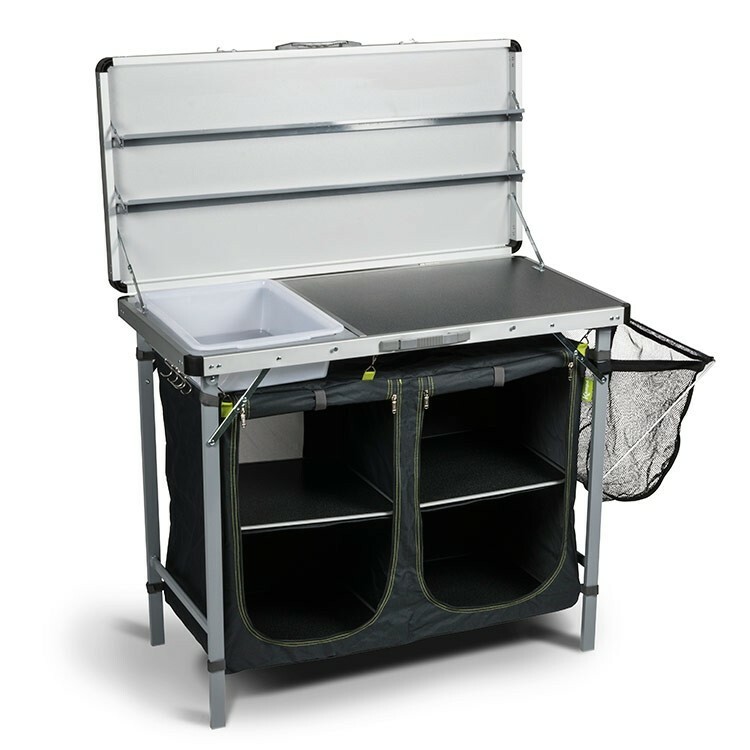 For those campers who go ‘off grid’ you can get non-electric coolers that keep your food and beer chilled for up to 5 days and your own solar panel to charge your phones. Sadly though, you’ll probably have to leave the telly at home! Campsite kitchens have had a makeover, too…. no longer a cheap table and a single burner hob, many campers want smart, luxury kitchens, like this upmarket bamboo kitchen unit, which have matching luxury tables. Camping kitchens are now reaching the height of sophistication. Far from a little three way fridge or coolbox, many campers even take full size fridges meant for the kitchen, although high end fridges and even freezers for camping are an option for those with an unlimited budget! However, cooking isn’t neglected either, it’s common to see set ups including a microwave, full hob, electric kettle, full stainless steel oven and even a portable hot water system which doubles up as a shower. Likewise, we’ve seen an increasing number of kitchen appliances under (or just outside) canvas this summer – the most glam set ups come with a choice of hob, oven, induction hob, electric griddle, bread makers, portable barbecues, pizza ovens and the like – we’ve seen it all and even own some! Like most modern campers, we love our set up and truly, some of these items get added to our mental wish list, which is probably where, in our case, it should stay. It’s easy to get carried away. Ever since I saw one, I wanted a kitchen unit complete with kitchen sink, and our luxury model from Kampa is indeed impressive. Make no mistake, I love the way our camping kitchen looks. but there is only two of us and we spend ages assembling it, as well as all our other kitchen paraphernalia for just one weekend, when we will probably eat in the nearest pub anyway – leaving me moaning at the time it takes to put down, remaining unused. However, for a big family, an impressive kitchen doesn’t just look good, it is a huge moneysaver, so if you’ve spent thousands on a tent, having a nice kitchen is probably a wise choice. That said, for most people, the simple canister stove cooker in Halfords, for just £8, will meet most needs. One final word – no matter what kitchen equipment you take, don’t cook inside your tent, and don’t EVER bring ANY BBQ, even a gas one that you think has gone out under your tent canvas. It’s a mistake that has claimed the lives of countless campers, tents don’t cope well with poisonous carbon monoxide – and usually the campers thought they were safe, as it was out – but it can be fatal in minutes. You spend thousands on camping equipment but a carbon monoxide detector costs £13. After reading horror stories, it’s something I strongly recommend you carry with you. Probably my loudest objection to any form of camping was the thought of sleeping on a blow-up mattress on the floor. However, these days, even sleeping on the floor is optional for campers. 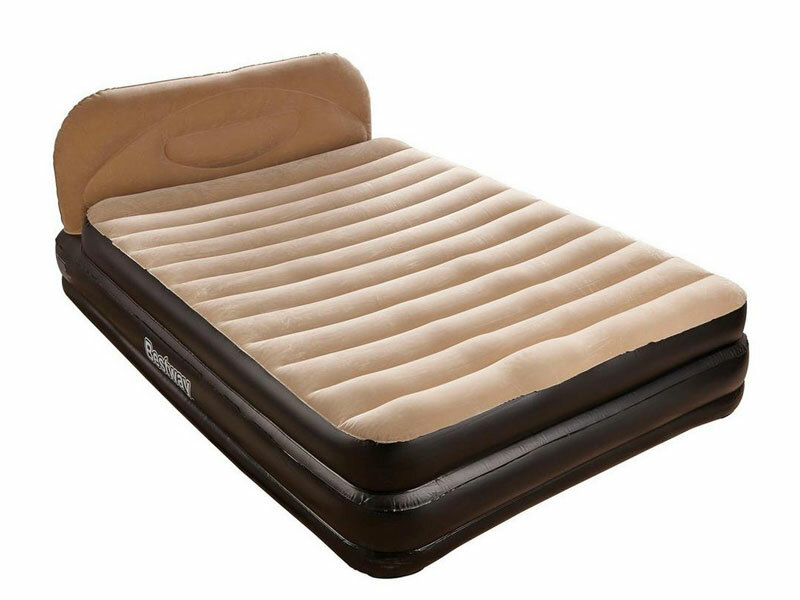 A quick glance at many modern set ups reveals full height beds, whether that’s an inflatable (like this Queen Size one, complete with Head Board) or a modern camp bed with luxury self-inflating mattress on top. Is it the end for Sleeping Bags? You could be forgiven for thinking sleeping bags are so yesterday, as many folks take duvets instead these days, and even manage to find camping-themed duvet covers. However, sleeping bags are warmer and take up less space in the car. I can’t be parted from my double sleeping bag, which I keep to myself, with an extra single just in case I’m cold. A word of warning though, not all sleeping bags are the same. You’ll find some for a tenner and some for a few hundred pounds – there is a difference. Really expensive sleeping bags tend to be made from very warm but very lightweight fabric, and many of them are designed to keep campers warm in sub-zero temperatures in places like Everest – suffice to say, overkill for a wet weekend in Wales and an unnecessary expense for the average camper – in fact, in normal weather, you’d probably be too hot. Nonetheless, even in Summer, unless it’s very warm, if a sleeping bag is rated as summer only, ‘suitable for sleepovers’, or ‘perfect for festivals’ it may not be warm enough. Good quality sleeping bags are rated by season, and as an experienced camper, I wouldn’t bother with anything less than 2 season – and the 3 season usually only costs a few pounds more. 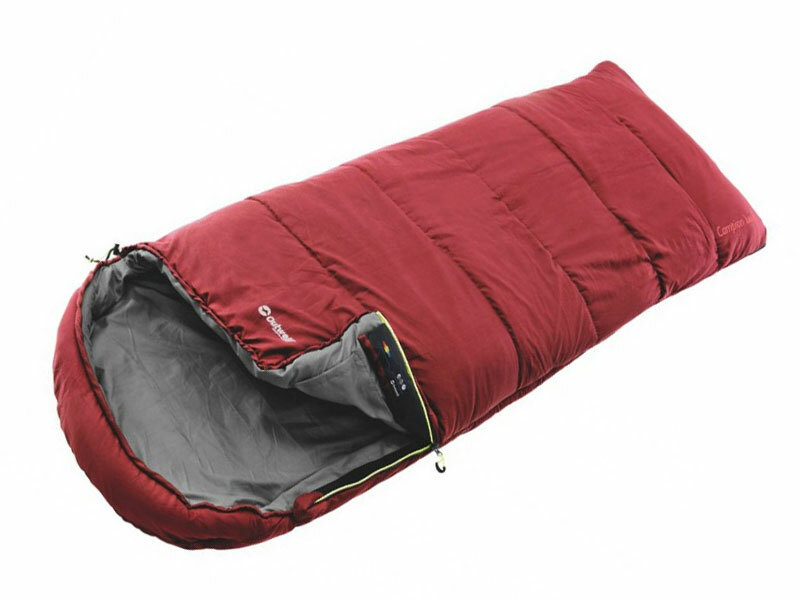 We have Outwell’s Campion 3 season sleeping bags – and we love them. No matter what you decide to get, sleeping comfort is not where to cut corners.